Here in Sheffield, food wastage is an issue. As it is in many, many places globally. 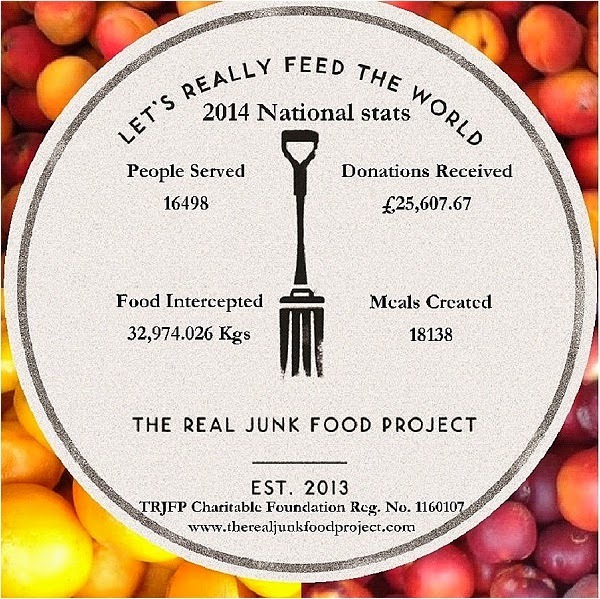 Today's blog post is showcasing the brand new branch of The Real Junk Food Project. I encourage you to find you own local group and get involved. The concept was the original idea of Adam Smith a chef from Yorkshire who became preoccupied with the growing problem of wasted food after spending a year working on farms in Australia. Adam returned to Leeds and connected with Sam Joseph and Conor Walsh, two University students who had been exposed to supermarket waste for years, together their passion, energy and dedication created the first PAYF café in Armley, Leeds in December 2013. It has sparked the creation of a national organic network of similar cafés totalling over 40 that serve 100% food surplus on a strictly Pay­As­You­Feel (PAYF) basis. Over the past 12 months the projects have intercepted close to 50 tonnes of food and fed over 16500 people. This is a collaborative effort to bring about a radical change in our food system. The Sheffield project is a voluntary run food waste campaign whose entire menu will be composed of only ‘waste’ or ‘surplus’ food. Our food will come from a variety of sources from local businesses, supermarkets, supermarket bins/skips, catering events, local households, food banks, farms and wholesalers. There has already been a huge amount of interest from organisations in Sheffield such as Sheffield on a Plate, PJ Taste, the Sheffield Food Collective and many interested individuals. Sheffield is ready for this! You will be challenged to think about the food you are eating which will be perfectly healthy and delicious and would otherwise have been in a landfill. Meals produced will be available on a ‘Pay­As­You­Feel’ basis meaning that you can chose to pay in money, skills or your energy by washing up, helping out, teaching us something. By reconnecting with the simple values of feeding the community we hope to engage people in becoming involved with the project and helping each other out. The Sheffield project is looking for a venue to host it’s first pop­up waste food showcase! Our requirements are simply a kitchen and a seating area. Other projects have started off in community centres, church kitchens, abandoned cafe’s etc. We have a host of willing volunteers to help out! Jo Hercberg, the Sheffield project director will be at this seminar at the Grantham Centre, Sheffield on 22nd April at 13:00 if you want to say hello. This is not a sponsored, collaborative or paid post. Curious Tonic showcases causes close to our communities' hearts, wherever you may be, and whoever you are.